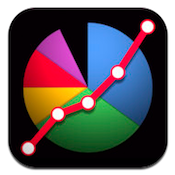 MyStats is an iPhone app developed by NEOREX. Ranked as the #1 Business App in Japan multiple times, MyStats is now available for US iPhone users. 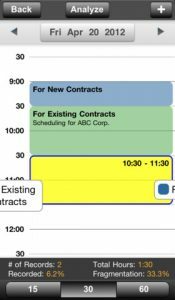 This handy app allows users to track their time, leading to better time management. 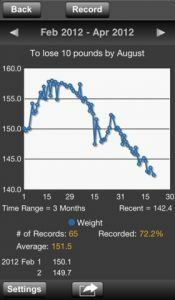 Depending on what your goals are, you can use MyStats to track your time as a graph (great for tracking weight loss or exercise! ), or use a fragmentation grid to visualize the way you are spending your time each day. MyStats lets you record truly detailed information, but in an app that is simple to navigate. MyStats lets users record daily or timed activities. Additionally, users can input their Evernote data to analyze your monthly usage and number of notes. Once you’ve started recording your daytime activities, you can then easily see your timed or daily activities in a pie chart or line graph. 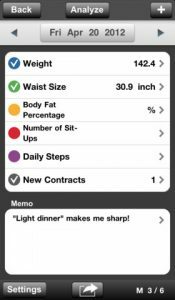 Additionally, you can view all your daily memos in one screen, which gives you some excellent qualitative data to review each month. The most recent version (Version 1.31) includes some pretty cool updates. Among them: a “slide select” for selecting and recording the length of time that you spend on a given activity, as well as the ability to use Dropbox to backup and restore your MyStats settings. The app is also now optimized for the iPhone 5. If you need a time tracker app, give MyStats some serious consideration. You can monitor how your time is spent, track your progress towards goals, and see how results compare to last week or last month. 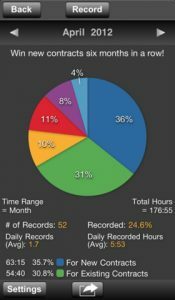 Sure, it takes a lot of time to track and input your time…but with an app like MyStats, it’s a valuable step towards making a more productive use of your time while you’re on the clock. MyStatsis compatible with iPhone, iPod touch, and iPad. Requires iOS 4.3 or later. This app is optimized for iPhone 5.